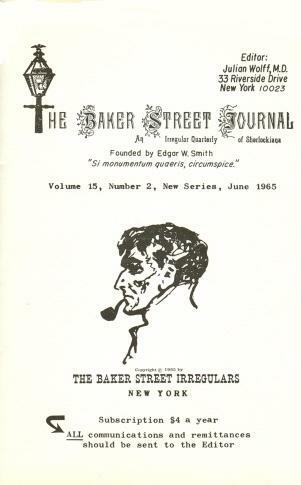 We offer a digest of Chess Notes items about Sherlock Holmes. 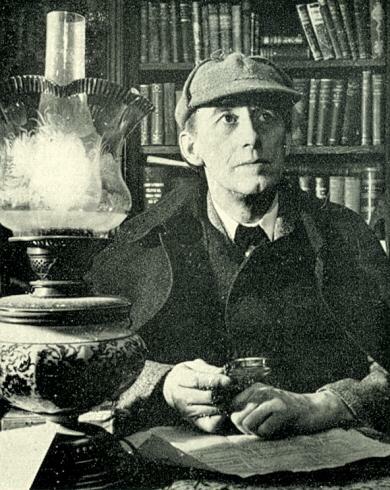 Maxwell Bukofzer (1875-1958) wrote a number of Sherlock Holmes stories with a chess theme, such as ‘The Adventure of the Mother-of-Pearl Buttons’ in the Chess Amateur, January 1925 (pages 123-125), February 1925 (pages 152-154) and March 1925 (pages 186-188), as well as passim in The Gambit in the late 1920s. 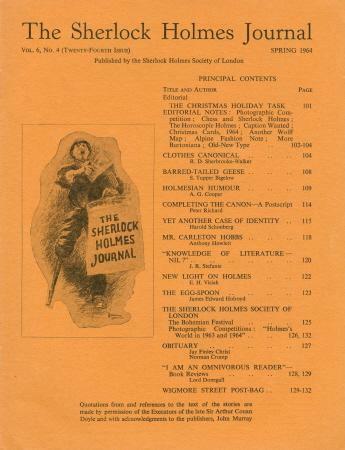 Mark N. Taylor (Mt Berry, GA, USA) reports that a catalogue by Kester Svendsen lists a short story entitled ‘The Mystery of the Missing Pawn: An Adventure of Herlock Shomes’ as having been published on pages 33-34 of the British Chess Bulletin, January 1911. 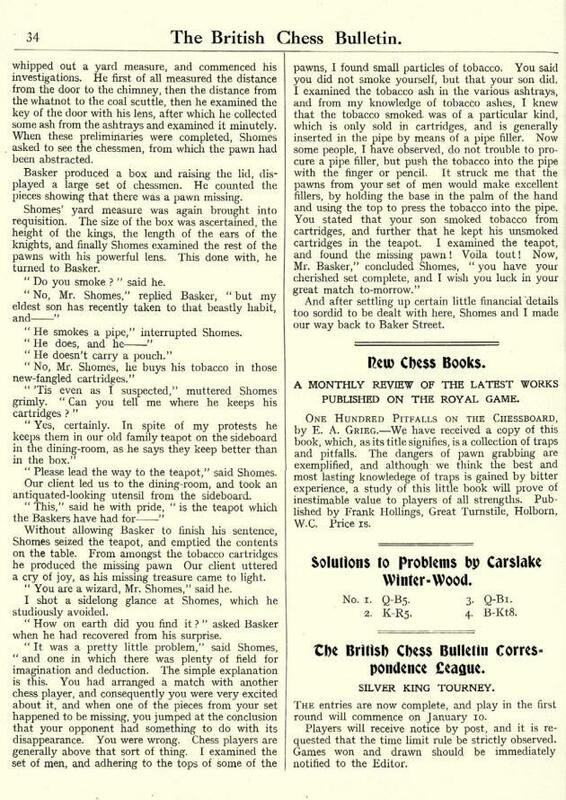 We should like to hear from any reader who can tell us more about the Bulletin, a very scarce publication. According to the entry in Douglas Betts’ Annotated Bibliography, it was ‘a monthly chess journal at a popular price’ edited by H.T. Dickinson and ran for four issues (October 1910 to January 1911). ‘Dear Dr Watson: Can you solve this? 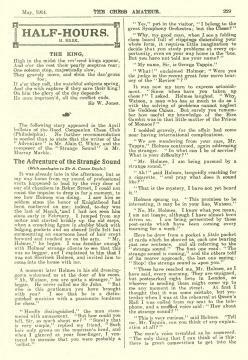 Watson believed that he had found the solution, only to be contradicted by Sherlock Holmes. The composition was featured in an article ‘Dr Watson Solves a Problem’ by P.G. 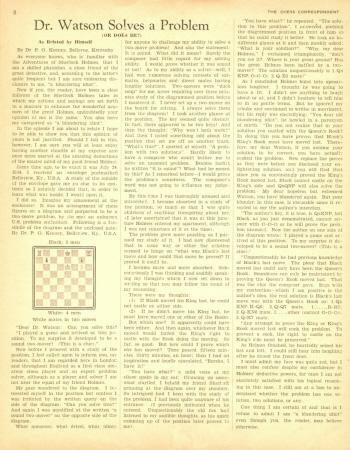 Keeney on page 8 of the January 1945 issue of the Chess Correspondent. Almost impossible to summarize, it is given here in full. Click here for larger versions of page 229 and page 230. 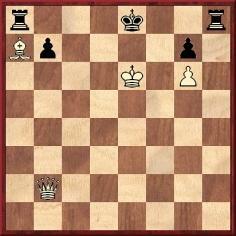 ‘The solution to Marble’s problem is 1 Kf6 f1(white N) 2 Ne3, 1...f1(white Q or B) 2 Qc2 (or, alternatively, 2 Qxe1 in the former case), or 1...f1(white R) 2 Rxe1. 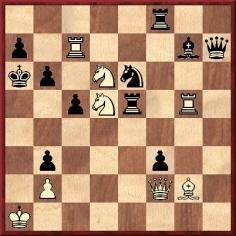 1 e3 fails to 1...f1(white N) because the mating square is now blocked. 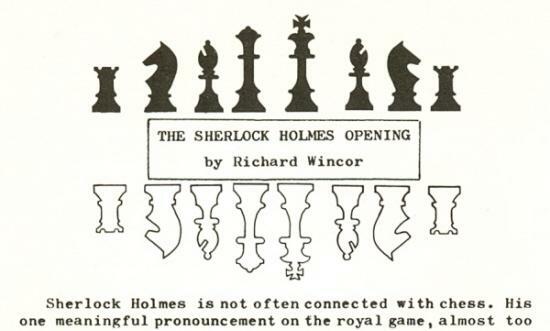 This position was featured in a Sherlock Holmes vignette ‘Chess in Fiction’ by Hotspur on pages 15-16 of the January 1964 BCM. 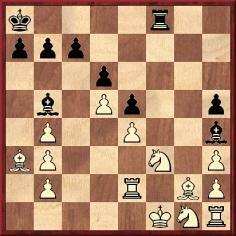 In a cliff-ledge showdown, Moriarty played 36...fxg2 (‘Time to resign, I think, Mr Holmes.’), but ‘Holmes nonchalantly produced his hypodermic syringe and applied a shot of his favourite drug Morphy-A’ and played 37 Qe2+ Rxe2 38 Nb4+ cxb4 39 Ra5+. 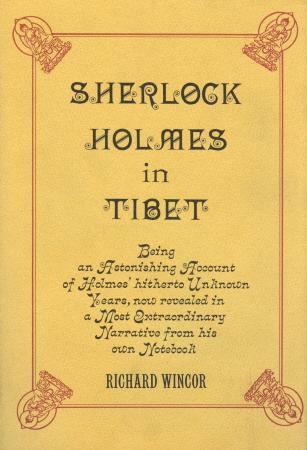 Moriarty then ‘made the only move open to him – over the cliff – board, men and Moriarty’. 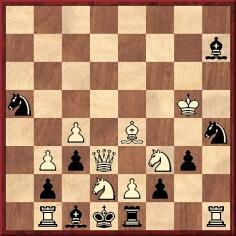 As Holmes later reflected, in the diagrammed position Black could have played 36...Re1+ 37 Qxe1 Bxb2+, with mate in two more moves. Addition on 1 March 2009: Pages 169-171 of the June 1966 BCM presented an article by Irwin L. Stein entitled ‘The Case of the Curious Colonel’. 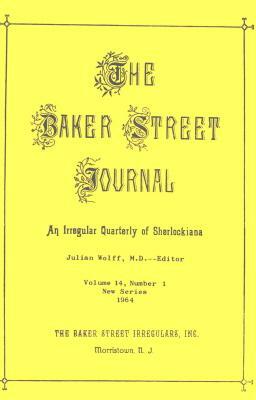 Its thesis was that Sherlock Holmes played at Monte Carlo, 1903 under the name Colonel Moreau. ‘The Adventure of the Black Bishop’ by Mark Coggins was published on pages 253-286 of the anthology Masters of Technique edited by H. Goldowsky (Newton Highlands, 2010). ‘Bukofzer, Maxwell. 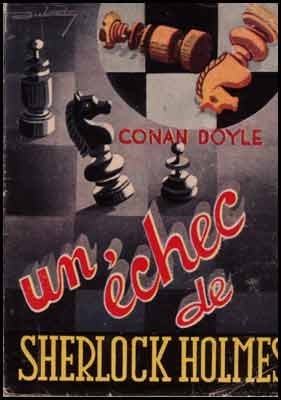 Sherlock Holmes Chess Adventures, No. 1-13; May 9, 1914-? 1 v. (96, 59 p.) illus. 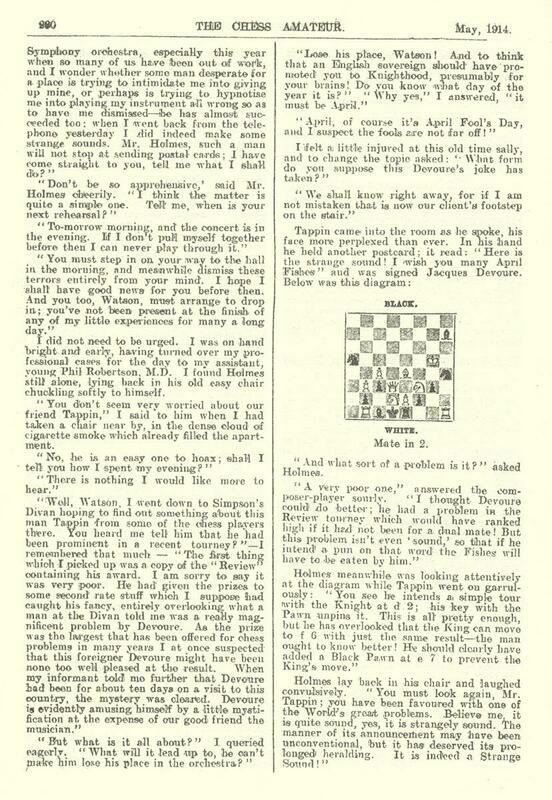 We add that The Puzzling Adventure of the Misunderstood Monkey Business was reproduced on pages 4-8 of the January 1916 American Chess Bulletin. 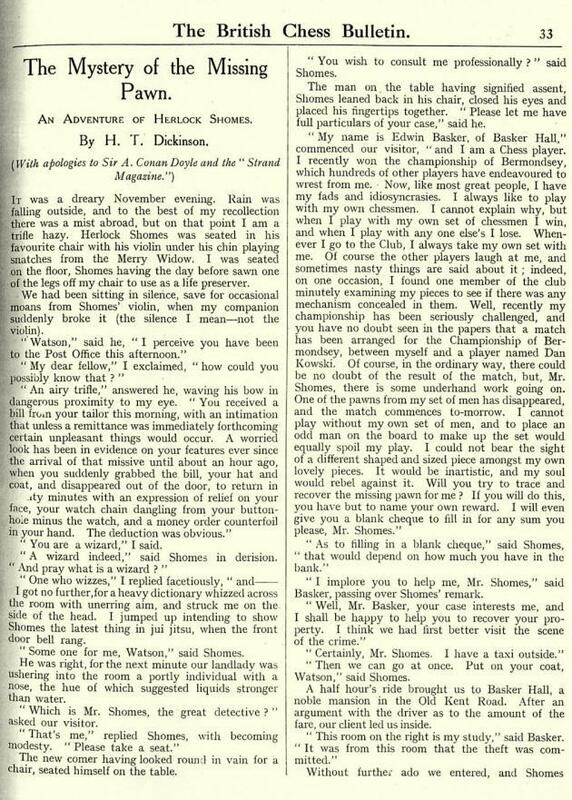 A further Holmes story by Bukofzer, entitled Christmas Fun, appeared on pages 242-243 of the December 1934 Chess Review. 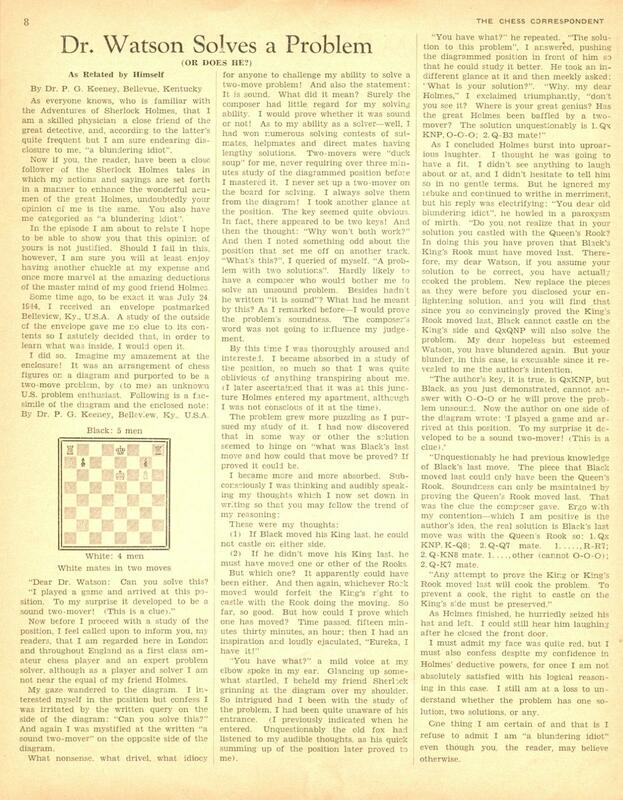 A further story is ‘The Adventure of the Obstruent Chessmen’ by Thomas F. Mosimann on page 238 of Chess Review, August 1960. 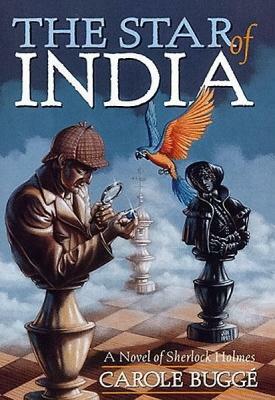 It was reprinted on pages 171-175 of The Best In Chess by I.A. Horowitz and J.S. Battell (New York, 1965), with the author’s surname given as ‘Mosiman’. ‘Das verschwundene Schachstein (Ein Hörspiel für Schachdenker von Dr. A. Kraemer)’ was reproduced on pages 142-145 of Ado Kraemer by Ralf J. Binnewirtz (Treuenhagen, 2012). 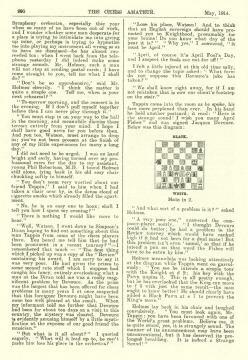 Pages 101-123 of Chess Chatter & Chaff by P.H. 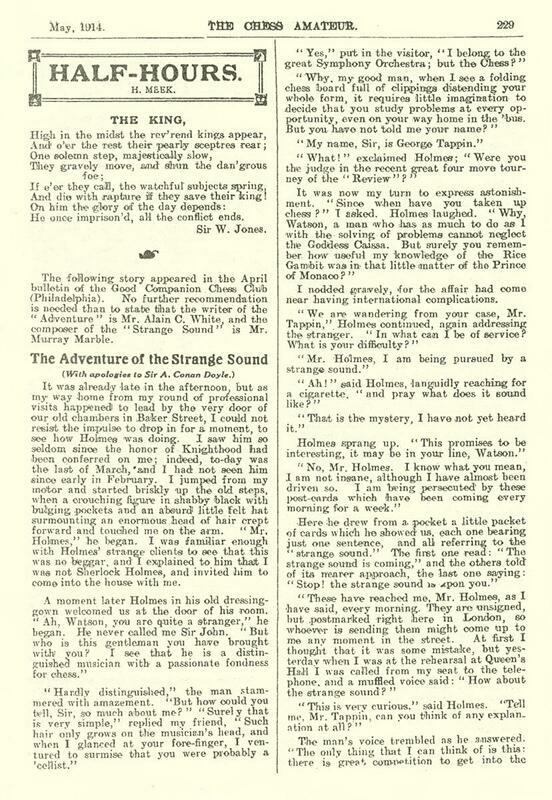 Williams (Stroud, 1909) have the short story ‘The Missing Motor-Car. An unauthorized and preposterous adventure of Sherlaw Combs’. Latest update: 18 August 2014.